An interesting article came my way today courtesy of a friend “BC”. The article is Deconstructing ShadowStats. Why is it so Loved by its Followers but Scorned by Economists? by Ed Dolan. Mish readers likely know that I believe inflation to be understated, and that I also believe Williams’ ShadowStats is wildly on the high side. For example, please consider GDP, Real GDP, and Shadowstats “Theater of the Absurd” GDP. I am convinced the best thing for Greece is to tell the troika where to go. And recent events (at least until today) suggested Greece would do just that. On the other hand, extreme sentiment is usually wrong. It may not be, it just usually is. So please consider the British betting site, William Hill. The inevitable in Greece gets closer and closer. Looking back, I wonder how many rabbits in the hat there were. More importantly, how many still remain? I believe the answer to the latter question is zero. In a move 100% guaranteed to blow up at a later date, the ECB Said to Start Buying Covered Bonds With Negative Yields. The European Central Bank started buying covered bonds with negative yields as its asset-purchase program reduces the supply of the highly rated debt, according to two people familiar with the matter. The economic recovery in Spain has gone from jobless to jobloss. Spain shed 114,300 jobs in the first quarter of 2015. Via translation from El Pais, Spain’s Unemployment Rate Rose Slightly in the First Quarter. It is extremely refreshing to see a large, prominent, and historically accurate fund manager lay it on the line. GMO does that quarter after quarter, with no-nonsense projections. 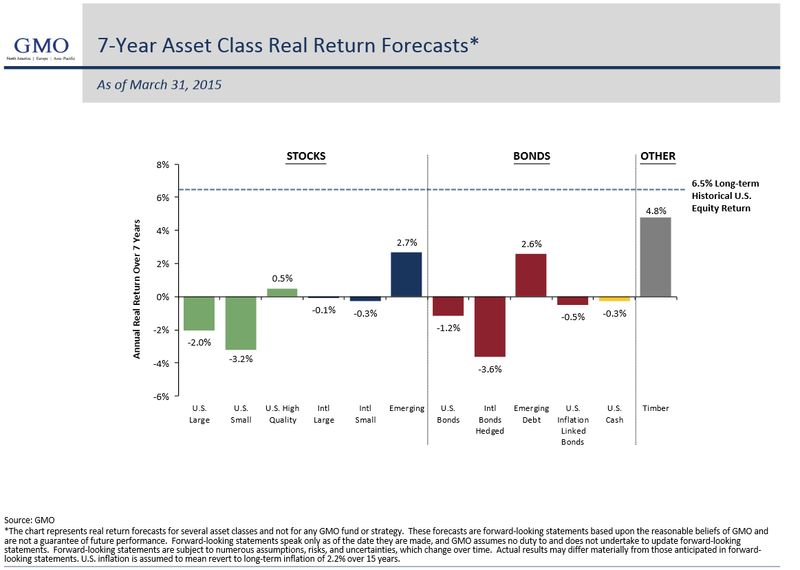 As of March 31, their 7-Year Asset Class Real Return Forecast is as follows. Via massive QE purchases of bonds, ECB president Mario Draghi is flooding Europe with cash that European banks don’t want and cannot use. One curious result of unwarranted QE is a negative interbank lending rate: Banks Paid to Borrow as Three-Month Euribor Drops Below Zero.